The best holiday experience I have ever had. From start to finish, everything was perfect! When it comes to Boot Camps; they are not all the same! The incredible mountain setting we have as our base provides motivation and enables fantastic exercise opportunities. Some people are driven to get outside, to see the world and be amongst nature. I have to believe that the percentage of people that feel the call increases to 100 when living in the mountains. We have such a passion for our surroundings and all the ways we can experience them. Since living here we have embraced our passion for road biking, swimming, running and hiking; the fitness you gain from regular hiking here is incredible, and the sights that you are rewarded with are breath-taking. After a winter season, filled with cheeses, wines and rich French foods we welcome the start of spring, with lighter menus and more exercise options available to get us out into the world. We have found that with a delicious healthy meal plan and exercise program we can shed off the extra winter layer in less than a week and get on with our summer of fun. These thoughts developed into our tried and tested Alpine Action Adventures Boot Camps. Our programmes run in May and September, bookending the summer months. Our team is made up of Army and Navy PTI’s that are supportive and get you achieving more than you’d think would be possible in the mountains, to increase fitness and your mental strength. Boot camp attendees usually book with us for a variety of reasons; because they have lost their fitness mojo, because they want to push their training to the next level or simply to lose a little weight and begin on a path to a healthier lifestyle. We can tailor our programme to suit all leels of fitness as long as participants and willing to get involved. 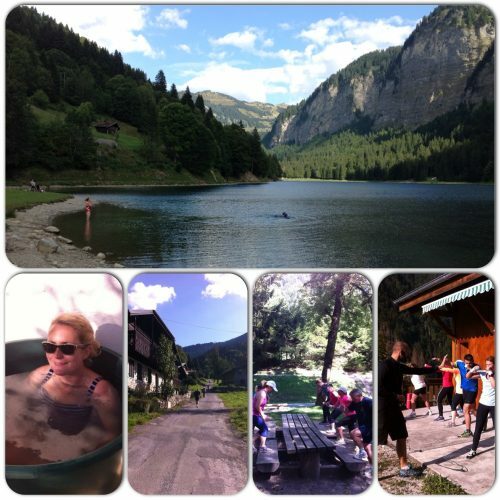 Your time here will consist of early morning training sessions, circuit training, long walks in the Alps, optional swimming plus fitness and cookery workshops. Boot camp group sizes are kept small to ensure you get the most out of your personal training, all our fitness training programmes are tailored to your individual needs. Results: you can expect to achieve weight loss between 4lbs and 11lbs over the weekend, as well as significant inch loss all over. More important than this is the mental strength and positivity our attendees take away with them. We have had a number of guests return, and they have either kept their weight off or continued on their weightless journey – they come back because they love it!